Foldable Waterproof Cotton Fabric Kids Laundry Hamper. Cotton Linen Fabric and Waterproof PE coating. 1. Durable, Foldable and Waterproof. 2. Easy to fold and expand, Convenient to use. 3. Easy to Clean. Just washed by hand. 4. Sturdy enough to stand on its own. 5. The handle can withstand about 11 LB. 1. Due to long distance transport, the product may have obvious folds. But you don't need to worry about that. The hamper will recover after a period of time. 2. Please allow 0.5"-1" error due to manual measurement. FASHION STYLE Fashion design suitable for family collection of dirty clothes and even Kid toys. SUITABLE SIZE Sturdy enough to stand on its own. The handle can withstand about 11 LB. NATURAL WATERPROOF MATERIAL Quality durable cotton linen fabric, with waterproof cover inside laundry sorter. 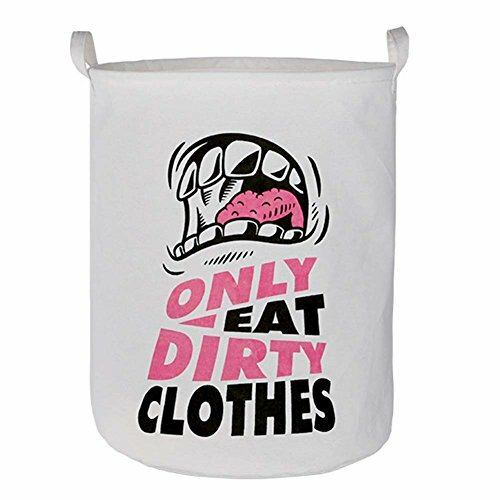 MULTI-FUNCTIONAL USE The laundry basket Easy to fold and expand. And fun for children to storage and move their toys, dirty clothes, books, magazines and so on. EASY TO CLEAN It can be washed by hand if it is dirty. If you have any questions about this product by RMay Store, contact us by completing and submitting the form below. If you are looking for a specif part number, please include it with your message.